Which comes first, happiness or the smile? While most of us assume that we smile because we feel happy, Clark psychologist James D. Laird argues that we can make ourselves happy just by smiling. Laird has spent his career studying this idea, called "self-perception theory," and his new book, "Feelings: The Perceptions of the Self," documents hundreds of studies in support of it. Laird's book aims to understand the connection between behavior and feelings. Laird argues that feelings are the consequence —not the cause—of behavior. Common sense says that when we see someone we love, we feel happy. Laird turns this common-sense view on its head: he says first we react to seeing that person, and then our perception of it as it occurs is the feeling. "The self-perception theory challenges traditional common sense views of emotions and behavior, " says Laird. "Although it sounds backward, in fact, the evidence is strong that self-perception theory is correct. " Laird first began to explore self-perception theory as a graduate student at the University of Rochester. While observing one of his clients smile in a peculiar way, Laird spent his drive home that evening thinking about that smile and what it meant. "For some reason I tried smiling the way that guy did. It didn't help. So I asked myself, ‘How do I smile?' I smiled in my way and then I thought, ‘I feel happy.' Then I tried scowling and gritting my teeth and that made me feel angry. Then I frowned and that made me feel depressed. So I thought, ‘That's funny. It's not supposed to happen that way.' We all know the feeling is supposed to cause the behavior not the other way around. But that 's not what I was experiencing." Whenever he had the chance, Laird read up on emotion literature. That's when he discovered William James and his theory of emotion. One hundred years ago, James proposed the self-perception view of emotion that behaviors cause feelings. Not only was the theory dismissed as "silly" by the 1920 s, in graduate school Laird recalls being taught James's theory only as an example of something that was wrong. Once he rediscovered James, however, Laird set out to find out if James was right. Laird started with an experiment in which he got people to smile and asked them how they felt. "The experiment had to involve a great deal of disguise. If I asked you to smile and then asked you how you feel, you 'd know what I want you to say. So I needed a decoy," says Laird. That decoy was electrodes. Laird pasted electrodes on people's faces—at the corners of the mouth, corners of the jaw and between the eyebrows—and disguised his real research goals by telling his subjects that he was measuring the electrical activity beneath the electrodes. He asked them to relax and contract their facial muscles. But the electrodes were not connected to a working machine. "It turned out that indeed others did have the same experience I had that day in the car. And most people deny that they 're having that experience. They think it doesn't work that way, but the evidence shows that it does," explains Laird. This initial experiment led to Laird conducting close to 100 others, including one that he wrote about in his dissertation. Today, almost forty years later, his new book reviews the evidence supporting the Jamesian view of emotion, and also extends James's hypothesis to include all kinds of feelings, not just those of emotion. 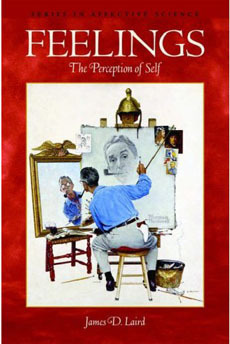 Early on in his research, Laird discovered that self-perception theory has limitations, which he examined. He found that while many people did reliably feel happy when induced to smile and angry when frowning, there were some who did not. So he began to study the differences between these two groups of people. "This is not really contradictory with James's theory of emotion, or self-perception theory," notes Laird. "It's just a more complicated theory than James, or I, thought initially." Laird says this discovery has been useful in extending its application to new emotions. One of the emotions Laird has been studying recently is pain. In this research, he has found individual differences in how much people 's feelings are rooted in their bodily activities and behaviors. Laird argues that there are two kinds of people: those who are focused on themselves (personal-cues) and those who are focused on the situation (situational-cues). What determines if you are more likely a personal-cue or situational-cue person? Laird says it 's your reaction to facial expressions—or whether or not you feel happy when you smile and sad when you frown, which is personal cue. Interestingly, personal-cue people are twice as sensitive to pain as situational-cue people. Laird has found the same pattern when studying premenstrual syndrome (PMS). Personal-cue women are more likely to feel PMS, while situational-cue women are less likely. Laird also has looked at confidence, feelings of liking and disliking, panic disorder, post-traumatic stress disorder and, along with Clark colleague and psychologist Dave Stevens, taste sensitivity. In all of these cases, Laird has found a link between facial cues and these emotions. "It's a big leap, but it's exciting," he says. "We're finding all of these things that have to do with how embodied your feelings are. " In the later chapters of his book, Laird takes his review of self-perception theory one step further, developing a way of thinking about feelings as part of a larger control system. "We need some model to explain how behavior affects feelings," says Laird. He likens his model to a home heating system, where the thermostat compares the desired temperature to the actual temperature and that triggers a reaction. If the thermostat is below the desired temperature, the furnace turns on, heats the house and then, indirectly, affects the thermostat. The thermostat changes in reaction to an indirect loop. Laird argues that feelings play an informational role in our emotional feedback loop. Instead of a furnace, we have muscles and limbs that trigger feelings and emotions. "In some ways I've been working on proving that common sense is wrong for 40 years," says Laird. "This book is the result of those 40 years."